On return from a recent business trip I found myself in a budget hotel room with no where to go and nothing to do for a long stretch of time. I discovered that this is the perfect environment to “binge-watch” a show that other people have been urging me to see. So I ignored the hotel TV, set my laptop on the bed, and fired up Netflix to watch Stranger Things. At 5pm I was well into the first episode. The characters and story were very compelling and I knew I was in for a long night of watching. At 8pm I took a short break, just long enough to get dinner and return to my screen. By midnight I knew there was no turning back, the season must be completed! I am a video game designer and I spend a great deal of time thinking about “player” (or viewer) experience. My job is to deliver an experience that will resonate with my audience, so I took special notice to how Stranger Things was crafted and what it delivered. I was pleasantly surprised that many of the things I am trying to achieve in my current (not yet announced) project were demonstrated on screen with great style and craftsmanship in Stranger Things. 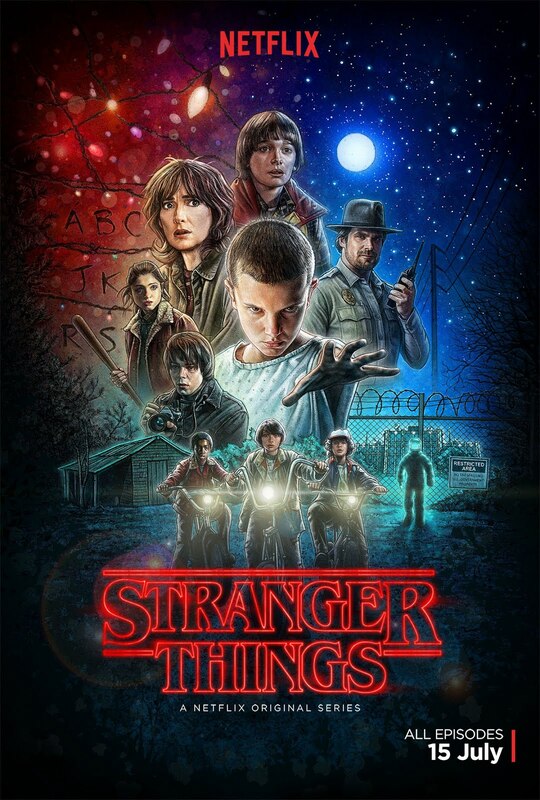 Stranger Things is like The Goonies meets The X-Files. A group of kids are faced with an impossible mystery and what pulls them through it all is their dedication to one another. But it's also more than that. In the long-form series format we get to experience the story from so many different angles. Winona Ryder's portrayal of a paranoid and grieving mother alongside her remaining son (played by Charlie Heaton) was as aggravating as it was inspiring to watch. We got to go crazy “with” her, which was excellently executed and well acted. Natalia Dyer's expression of teenage confusion, as she experiences an identity crisis, while dealing with frightening paranormal phenomena was a cinematic tightrope. And somehow they made it work, delivering a great deal of empathy while we watch her make questionable decisions, one after another. And I have to mention David Harbour's performance of the (mostly) lovable Sheriff Jim Hopper. A wounded hero with a less than admirable personality. Through his less-than-legal tactics he always manages to progress the story, help solve the mystery, and stay on the right side of the audience's moral compass. Back to The Goonies. The real story of Stranger Things is told through our young protagonists. A band of misfits named Mike (Finn Wolfhard), Dustin (Gaten Matarazzo), Lucas (Caleb McLaughlin), and the missing boy Will Byers (Noah Schnapp). There is a handy trade-off when Will goes missing and his friends go looking for him (against the Sheriff's orders) and they find the strange, androgynous, and equally young character named Eleven, played by Millie Bobby Brown. The loss of Will and the addition of Eleven throws the group into chaos. The season is then filled with secrets that “the grown ups” can't know, devious scientists and military organizations, and terrifying monsters and paranormal activity. It's all great sci-fi fodder that never makes total sense. And I'm okay with that. In my own work as a video game designer I'm constantly struggling with how much information I should divulge to the player versus what should be left to intrigue. Stranger Things absolutely leans on the side of intrigue, especially considering the season finale ending, which asks us more questions in the last 10 minutes than the last 5 hours have answered. They want to make another season. And again, I'm okay with that. But ultimately, my take-away from Stranger Things is what it has to say about friendship. Friendship and caring for one another seemed to be a constant theme throughout the season. I don't know if I've ever watched a sci-fi/horror flick where taking care of each other was so crucial to the plot and character development. Every character showed a soft spot, a vulnerability, at some time, and we reached a point of emotional intimacy with many of the characters. It was amazing to watch. You never hated anyone, even though the stakes were so high, life and death. Looking back on season one of Stranger Things, and relating it to my own life, I realize that friendship and intimacy are the real Stranger Things in my life. Making new friends, and letting people into your life, trusting them, can be just as scary as facing a monster. Looking forward to season two.